The bcf file extension is associated with the Art Explosion Business Card Factory, an application for Microsoft Windows that allows users to create professionals business cards. The bcf file stores various data used for internal purposes of the Business Card Factory. 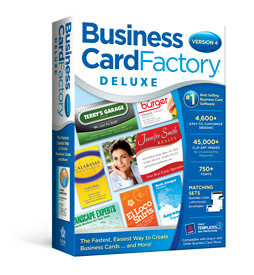 Business Card Factory Deluxe lets you easily create professional business cards in minutes-guaranteed! Choose from more than 4,600 customizable templates for virtually every type of business. Or create your own designs from more than 45,000+ clip art images, including 750 logo elements. Then, print your cards on micro-perforated card stock from Avery, PaperDirect and other manufacturers guaranteed to be 100% compatible. Programs supporting the exension bcf on the main platforms Windows, Mac, Linux or mobile. Click on the link to get more information about Business Card Factory for create bcf file action. Click on the software link for more information about Business Card Factory. Business Card Factory uses bcf file type for its internal purposes and/or also by different way than common edit or open file actions (eg. to install/execute/support an application itself, to store application or user data, configure program etc. ).